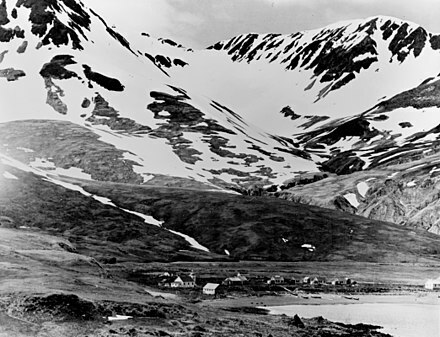 The Japanese occupation of Attu was the result of an invasion of the Aleutian Islands in Alaska during World War II. 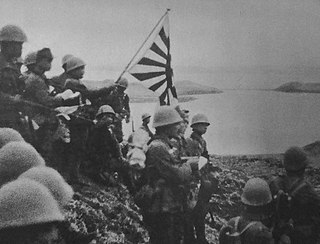 Imperial Japanese Army troops landed on 6 June 1942 at the same time as the invasion of Kiska. Along with the Kiska landing, it was the first time that the continental United States was invaded and occupied by a foreign power since the War of 1812, and was the second of the only two invasions of the United States during World War II. The occupation ended with the Allied victory in the Battle of Attu on 30 May 1943. In May 1942, the Japanese began a campaign against Midway, their objective being to occupy the islands and destroy the remaining United States Navy forces in the Pacific. In order to deceive the American Pacific Fleet, an attack was ordered to take place in the Aleutians, thus beginning the Aleutian Islands Campaign. During the Battle of Midway, Japanese forces were repulsed in a decisive action, meanwhile on 6 June, Japanese naval forces under Boshirō Hosogaya landed troops unopposed at Kiska and Attu islands. A force consisting of 1,140 infantry under Major Matsutoshi Hosumi took control of the island and captured Attu’s population, which consisted of 45 Aleuts and two white Americans, Charles Foster Jones (1879-1942), an amateur radio operator and weather reporter, originally from St. Paris, Ohio, and his wife Etta (1879-1965), a teacher and nurse, originally from Vineland, New Jersey. The village consisted of several houses around Chichagof Harbor. 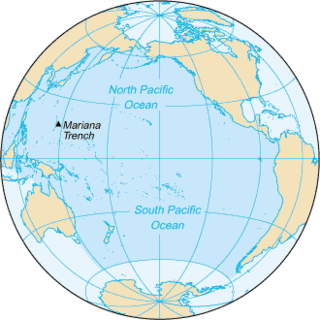 Midway Atoll is a 2.4-square-mile (6.2 km2) atoll in the North Pacific Ocean at 28°12′N177°21′W. Midway is roughly equidistant between North America and Asia. 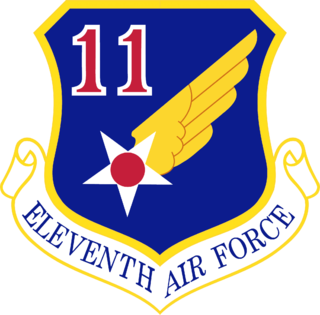 Midway Atoll is an unorganized, unincorporated territory of the United States. Midway continues to be the only island in the Hawaiian archipelago that is not part of the state of Hawaii. Unlike the other Hawaiian islands, Midway observes Samoa Time, which is one hour behind the time in the state of Hawaii. 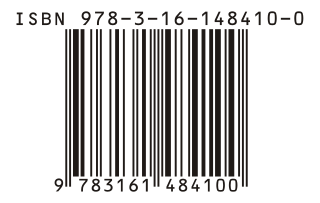 For statistical purposes, Midway is grouped as one of the United States Minor Outlying Islands. The Midway Atoll National Wildlife Refuge, encompassing 590,991.50 acres (239,165.77 ha) of land and water in the surrounding area, is administered by the United States Fish and Wildlife Service (FWS). The refuge and most of its surrounding area are part of the larger Papahānaumokuākea Marine National Monument. 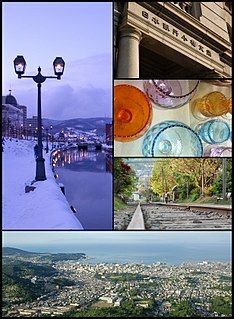 Otaru is a city and port in Shiribeshi Subprefecture, Hokkaido, Japan, northwest of Sapporo. The city faces the Ishikari Bay, and has long served as the main port of the bay. With its many historical buildings, Otaru is a popular tourist destination. Because it is a 25-minute drive from Sapporo, it has recently grown as a bedroom community. The Battle of Rabaul, also known by the Japanese as Operation R, was fought on the island of New Britain in the Australian Territory of New Guinea, in January and February 1942. It was a strategically significant defeat of Allied forces by Japan in the Pacific campaign of World War II, with the Japanese invasion force quickly overwhelming the small Australian garrison, the majority of which was either killed or captured. Hostilities on the neighbouring island of New Ireland are also usually considered to be part of the same battle. Rabaul was significant because of its proximity to the Japanese territory of the Caroline Islands, site of a major Imperial Japanese Navy base on Truk. A fortification is a military construction or building designed for the defense of territories in warfare, and is also used to solidify rule in a region during peacetime. The term is derived from the Latin fortis ("strong") and facere. Unalaska is an island in the Fox Islands group of the Aleutian Islands in the US state of Alaska located at 53°38′N167°00′W. The island has a land area of 1,051 square miles (2,720 km2). It measures 79.4 mi (127.8 km) long and 34.7 mi (55.8 km) wide. The city of Unalaska, Alaska, covers part of the island and all of neighboring Amaknak Island where the Port of Dutch Harbor is located. The population of the island excluding Amaknak as of the 2000 census was 1,759 residents. Dutch Harbor is a harbor on Amaknak Island in Unalaska, Alaska. It was the location of the Battle of Dutch Harbor in June 1942, and was one of the few sites, besides the attack on Pearl Harbor in Hawaii, in incorporated U.S. territory to be bombed by the Japanese during World War II. John Lesesne DeWitt was a general in the United States Army, best known for his vocal support of the internment of Japanese-Americans during World War II. A banzai charge is the term used by the Allied forces to refer to Japanese human wave attacks and swarming mounted by infantry units. This term came from the Japanese cry "Tennōheika Banzai", shortened to banzai, specifically referring to a tactic used by Japanese soldiers during the Pacific War. The Aleutian Islands Campaign was a military campaign conducted by the United States and Japan in the Aleutian Islands, part of the Territory of Alaska, in the American theater and the Pacific theater of World War II starting on 3 June 1942. 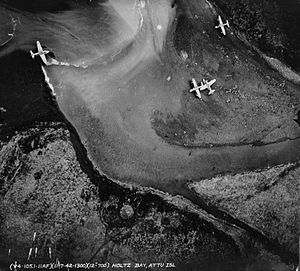 In the only two invasions of the United States during the war, a small Japanese force occupied the islands of Attu and Kiska, where the remoteness of the islands and the challenges of weather and terrain delayed a larger U.S.-Canadian force sent to eject them for nearly a year. The islands' strategic value was their ability to control Pacific transportation routes, which is why U.S. General Billy Mitchell stated to the U.S. Congress in 1935, "I believe that in the future, whoever holds Alaska will hold the world. I think it is the most important strategic place in the world." The Japanese reasoned that control of the Aleutians would prevent a possible U.S. attack across the Northern Pacific. Similarly, the U.S. feared that the islands would be used as bases from which to carry out a full-scale aerial attack on cities and ports in the U.S. West Coast. Castner's Cutthroats was the unofficial name for the 1st Alaskan Combat Intelligence Platoon (Provisional), also known as Alaskan Scouts. 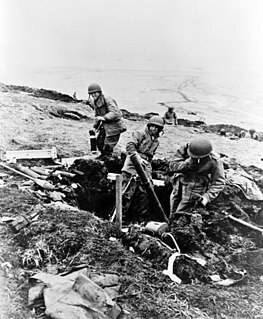 Castner's Cutthroats fought during World War II and were instrumental in defeating the Japanese during the Aleutian Islands Campaign. The unit was composed of just sixty-five men selected to perform reconnaissance missions in the Aleutian Islands during the war. USS Heywood (APA-6) was a Heywood-class attack transport acquired by the U.S. Navy for service as a troop carrier just prior to World War II. She served in the Pacific War, a very dangerous area in the early years of the war, and safely returned home post-war with seven battle stars to her credit. The Japanese occupation of Kiska took place between 6 June 1942 and 28 July 1943 during the Aleutian Islands Campaign of the American Theater and the Pacific Theater of World War II. 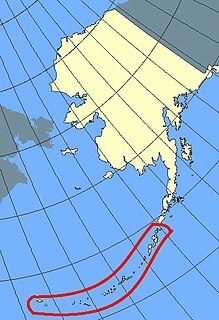 The Japanese occupied Kiska and nearby Attu Island in order to protect the northern flank of the Japanese Empire. Along with the Attu landing the same time, it was the first time that the continental United States was occupied by a foreign power since the War of 1812, and was one of the only two invasions of the United States during World War II. 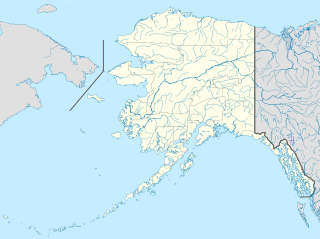 Chichagof Harbor is an inlet on the northeast coast of the island of Attu in the Aleutian Islands in Alaska. It is named after Russian Admiral and polar explorer Vasily Chichagov. It is the location of the Aleut village served by an American pastor and his wife. It was also where some heavy fighting took place during the recapture of the island from the Japanese during the Battle of Attu in World War II and afterwards was the site of Battery B 42nd Coast Artillery Battalion. Kiska Army Airfield is an abandoned military airfield, first Japanese and then US, on Kiska island, Aleutian Islands, Alaska, USA. ↑ Chloe, John Haile (2017). Attu: The Forgotten Battle. National Park Service. pp. 32–33. ISBN 0996583734.